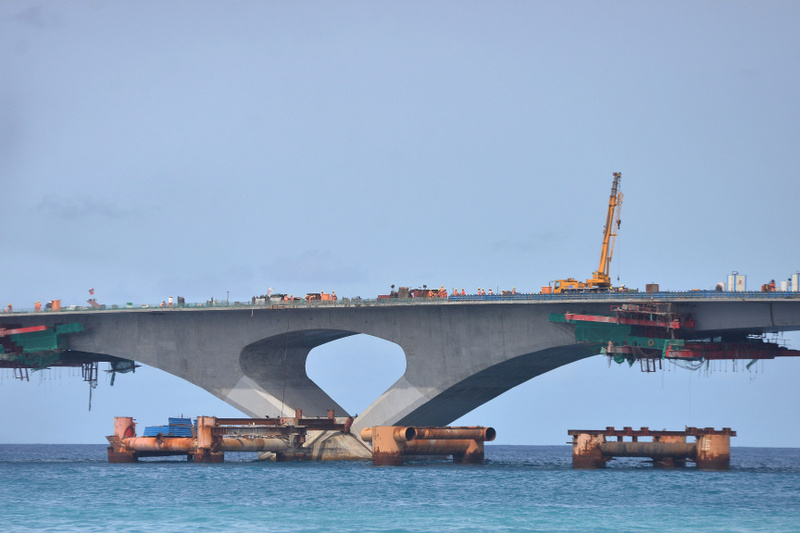 Workers have started removing the platform installed for construction of the Sinamale Bridge between Male’ City and Hulhule’ as the project nears completion. Workers have now removed a large portion of the iron platform. The platform was used to carry many of the heavy material used for construction of the bridge. But workers are now removing the platform as the bridge is now nearly complete. Workers are now installing asphalt on the floor of the bridge, after which they will begin installing the light fixtures. CCCC, which is in charge of constructing the bridge has guaranteed the bridge will be completed in late August. Ministry of Housing and Infrastructure has also announced the bridge will be completed and opened in August. The USD 300 million project was financed with a USD 100 million grant from the government of China, a USD 170 million 2 percent interest rate loan from China, and USD 30 million from the Maldivian government.